That title really explains this post. 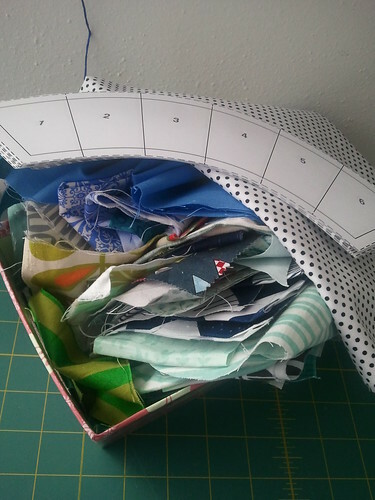 It's kind of all over the place, sewing-wise. First up, the commissioned quilt using the American Jane ABC fabric. The customer requested a disappearing nine-patch. We sat down the other day and I gave lots of options for fun and interesting designs, and he picked the design from the quilt sitting on my couch. I'm not complaining exactly, as a disappearing nine-patch is about as easy as it comes, but from a creative aspect I'd have liked something with a little more challenge. That being said, I hate these four blocks. HATE. 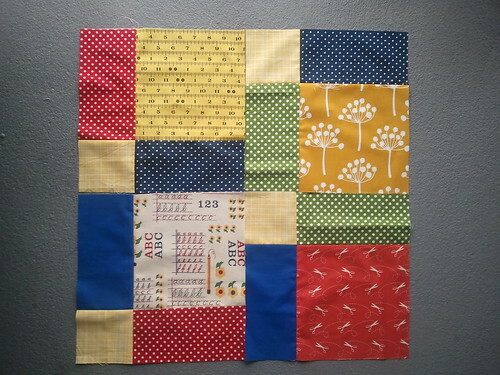 Obviously this was just one block that I cut up to see how it looks, so the same fabrics are right next to each other [soooo many polka dots], but I think I'm despising how "primary color" it looks. What's happening with the DWR this week? Nothing so far. My pile sits on my table, looking forlornly at me while I ignore it in favor of other more exciting things. Poor DWR. Hopefully I can work on it tonight as I have zero Friday night plans. 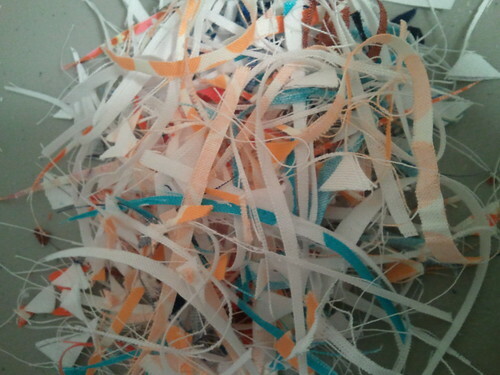 Hundreds of HSTs to be trimmed. And trimming is bad for my soul. Seriously. It kills me a little, so I can only do 20 or 30 at a time before it feels like my brain is oozing out of my skull. I felt that way about calculus back in the day too. And finally, some autumn care packages. I love sending packages. If money was no worry I'd constantly send packages to friends. This is why I love Christmas so much. I love picking things out for people that I know/hope that they'll love, packaging it up all pretty, and then waiting in anticipation for them to receive it. Seriously, is it Christmas yet? Anyways, my closest friends have slowly been moving out of the state for bigger and better things, so I thought I'd celebrate the season by sending out some goodies to them all. Variations on this package will be heading to Atlanta, LA, Berkeley, and Raleigh! 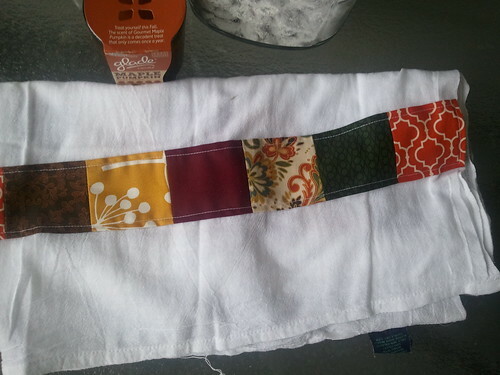 I bought a 4-pack of flour sack towels at Target for $4 and embellished each end with a strip of patchwork. Simple! 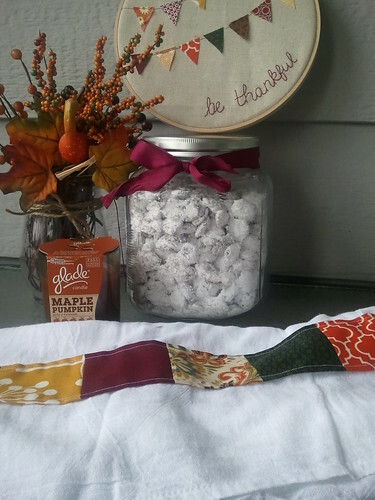 To round it all off I made some simple hoop wall art with teensy scraps of autumn-colored fabrics and a touch of hand embroidery on natural colored Essex. Which is perfect, since today is Handmade Parade day at There and Back! Ok. I love your hoop. I'm pretty sure (if I find time) that I'm going to copy you. You're super clever! I have like, zero decorations, and this is so cute. I love it. I hear you about dreading the first project. I felt that way making a quilt for my husband...but he really likes it, and I think the your quilt up there will look perfect for a school room. Keep at it! You'll make it awesome. 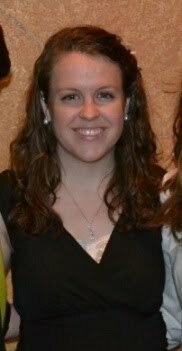 Beautiful hoop, Rebecca! Give yourself a couple of days with that block. I think it looks fine and I'll bet once you see a few others done, you will like it again. That is adorable! I love the idea of atumn care packages. I'm going to go pick me up some of those Target towels! 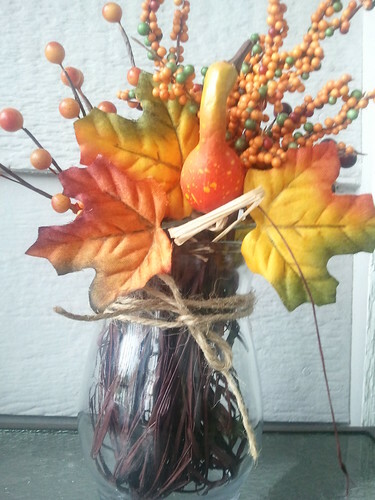 I love your autumn creations! The leaves and towels are great. 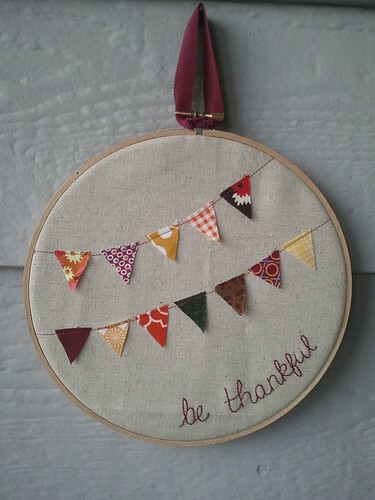 Your little hoop is so adorable too. Fall is one of my favorite seasons! Oh how I cannot wait for the colors to come out!